The way Sergeant Manuel Aguayo tells it, the history of the University Police Department Toy Drive is like many famous holiday stories. The tale goes something like this: Back in 1992 (or was it ’93? ), Sergeant Amado Ramirez brought an idea to then-Chief Ric Abeyta. With the holidays approaching, Ramirez wanted to do something for the community that he served—a community that he knew struggled to make ends meet, let alone put presents under the tree. That help has grown over two decades from delivering food boxes to a handful of families to bringing personalized presents to a projected 550 children from 200 low-income families this year. A huge number of volunteers make it possible, from donations to wrapping presents to joining the convoy of cruisers carrying Santa—an officer in blue wearing red for the day—as he knocks on each door and delivers each gift by name. 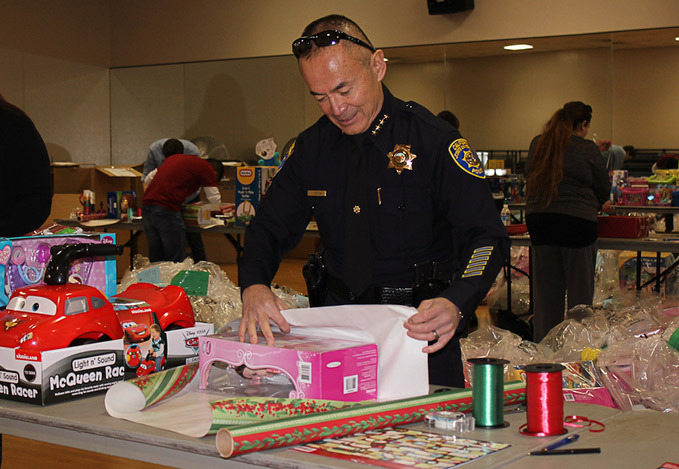 For more information on how you can help, visit the UPD Toy Drive website, or contact Captain Alan Cavallo at 408-924-6551.